There is a vague and ambiguous reference to one word in Article 9, namely, ‘Buddhism’ in contradistinction to ‘religion’. It is vague because it is not clear if Buddhism is used here synonymous with religion. This lack of clarity creates ambiguity in its definition. Simply put, as per Article 9 is Buddhism a religion or not? The concern is that there is neither an interpretation clause nor an explanation in the constitution on this word. The legislators apparently would have relied upon the popular or customary understanding that Buddhism is a religion. The Sinhala word used commonly is buddhagama possibly influenced by Christianity, Islam and Hinduism which are religions and referred to as ‘agama’ in the Sinhala language. ‘Agama’ means religion. It is suspect if this assumption or understanding in relation to Buddhism is correct. When it comes to legal interpretation what would direct the judicial mind, is to be seen. The judiciary can take the plain text meaning or the intention of the author (legislature) or give a pragmatic interpretation based on the true meaning of Buddhism. The last of the three may find the judiciary being criticised for judicial law making. Some inspiration could be had from Lord Wilberforce in the Privy Council who adopted the approach treating the constitution as sui generis, calling for principles of interpretation of its own suitable to its character. (Minister of Home Affairs (Bermuda) vs. Fishers (1980). In this context, the new constitution is a good opportunity for the framers to give thought to this without putting the judiciary on the spot. Since the constitution is the foundational law of the State its content in my view, should bear the essence of the thing that is being interpreted. Apart from the lacuna in the constitution, the other factor that weakens the interpretation of Buddhism as a religion is in the strict definition of religion. The Oxford dictionary defines Religion as “the belief in and worship of a superhuman controlling power, especially a personal God or gods”. The Merriam-Webster states religion as “the belief in a god or in a group of gods”; “an organized system of beliefs, ceremonies, and rules used to worship a god or a group of gods”. In addition, there is also no evidence that Gautama Buddha ever mentioned that his is a religious teaching. This position is substantiated by Mahathera Narada who explains that Buddhism is neither considered a religion nor a belief. “Buddhism is not strictly a religion in the sense in which that word is commonly understood, for it is not ‘a system of faith and worship,’ owing any allegiance to a supernatural god.” (Pg. 155, The Buddha and his teachings, Mahathera Narada). In the book, ‘What the Buddha taught’ Walpola Rahula thero writes, “In Buddhism emphasis is laid on ‘seeing’, knowing, understanding, and not on faith, or belief. Gotama wandered about the valley of Ganges, meeting famous religious teachers, studying and following their systems and methods, and submitting himself to rigorous ascetic practices. They did not satisfy him. So he abandoned all traditional religions and their methods and went his own way” (Pg. 1). So, the question whether Buddhism is a religion or not remains unanswered as far as the use of this word in the constitution is concerned. On the other hand, if Buddhism is not considered a religion but only as the dhamma of the Buddha, then one is faced with a different problem. The scope of Article 9 will be applicable narrowed down only to religions and not the dhamma. It states, “while assuring to all religions the rights granted by Articles 10 and 14(1)(e)”. Thereby denying the benefits of Article 9 to the Buddhists in so far as these two Articles are concerned. The above two Articles do not make any direct reference to Buddhism but, in fact, contain references to religion. This situation is disadvantageous to the Buddhist citizens of Sri Lanka as the assurance that is given to all religions would not be applicable to Buddhism. This, then, would be unfair and discriminatory against the Buddhists. It would place the Buddhist citizens in an unequal status in relation to those of other religions. by positing Buddhism to the “foremost place”, obviously has stratified Buddhism, relegating other religions to a lower level or a subclass. Irrespective of whether Buddhism is considered as a religion or not, Article 9 in effect has created a clear dichotomy which undermines the basic tenet of equality. The moment the ‘other’ factor comes into being it necessarily creates a distinction. Where a distinction is created it may have the potential to give way to discrimination especially, in a pluralistic society. Therefore, ensuring equality between the distinguished elements becomes significant in a democratic environment. This emphasis calls for greater circumspection when it is the constitution of the country in which not even the slightest semblance of inequality should have been pronounced. Analysing the words ‘foremost place’ in Article 9, using the law of identity reveals the existence of an apparent contradiction. From the Buddha dhamma point of view, is the phrase, “foremost place”, a self-contradicting term or a misnomer? There is no principle claim in the Buddha dhamma itself, wanting a foremost place amongst all religions. On the contrary, what the dhamma very clearly and in unequivocal terms states is that the cause of suffering is craving (tanha). It was King Asoka a convert to Buddhism, in about 250 BCE or 2250 years ago proceeded to establish a model for the relationship between state and religion that became predominant in the Theravada Buddhist world. (Asian Journal of Comparative Law, Volume 2, Issue 1 2007 Article 1. Buddhism, Human Rights and Constitutional Reform in Thailand). In puritanical terms this artificial elevation is an innovation into the buddhistic teachings. And, is in conflict with the practice of Gautama Buddha who relinquished his royalty seeking the ultimate Enlightenment, Nirvana. This is exemplified in the Buddha’s words, “Uno loko atitto tanha daso,” which translates to ‘the world is insatiable, enslaved to craving (tanha)’. The beauty of the concept of tanha in the dhamma is that it applies to both the craving for existence and even non-existence. Even the desire to attain Nirvana would fall into this category of tanha if the idea of Nirvana is not properly understood. The Buddha has declared that the desire for things, no matter what they are, begets sorrow “tanhaya jayati soko”. Thus the dhamma aims at putting an end to all aspects of craving as it is the root of all suffering. Well, in this context, it is difficult to understand the desire of some monks, who are expounding the same principles of dukkha to the layman, seeking to place Buddhism in the constitution or seeking to grant Buddhism the foremost place or wanting the protection of the sasana. Not only the monks but also the Buddhist laymen clamour for this. Are not all of the above demands considered as cravings according to the dhamma? Will not these cravings then be the cause of suffering to such people? The simple answer that the dhamma gives to these questions to my understanding is a resounding ‘yes’. This is clear as crystal. To seek the foremost place to Buddhism in my view, is not in harmony with the dhamma and undermines the efforts of the great teacher, Gautama Buddha. 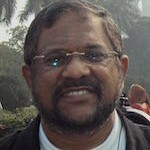 Venerable Professor Dhammavihari writes as follows explaining maithrya, “This typically horizontal concept of love and respect for life whereby one holds oneself as a part of an integrated whole, without any secret pacts as chosen or privileged people, is the keynote of the Buddhist concept of maitri. It admits of no vertical gradations with special loyalties to one’s religion or one’s race. That is why we are free to call it universal loving kindness”. (12 Essays). In the final instalment of this opinion, I propose to share my views on how to go forward harmoniously from the broader perspectives of reconciliation, co-existence and a brief look at comparative jurisprudence.